Now Reading: A blow-dry a day, will take you a long way? A blow-dry a day, will take you a long way? Weddings, reunions, interviews, coffee dates, and more – no matter the occasion, your hair needs to look fantastic. Your go-to? A good, old blow-dry! That being said, there’s something you should know about the blow-drying - if you don’t do it right, you might be frying your hair beyond repair! Luckily though, we’ve got you covered with some pro tips – that’ll turn your blow dryer into your best friend! The priority on your checklist while buying a blow-dryer should be customizable temperature and air stream settings. If it offers at least two levels in each setting, you’ve found The One. Variations make it easier to regulate the dryer and use the setting that’s perfect for your hair. Choose your temperature setting wisely. If you crank up the temperature of your hair dryer too high, it might make your hair brittle and prone to breakage. For all those with fine hair, this could be the deal breaker in your relationship with your dryer! Likewise, with the air stream setting – you need to make sure it isn’t too high. Otherwise the dryer will be difficult to control, and you’ll end up with more tangled hair than before. Before you start, make sure your hair is damp and not dripping wet. Exposing really wet hair to heat may cause the water droplets to boil, which in turn will damage the hair. Gently pat it with a cotton towel to soak up the excess water. The best way to cover all your hair is to section it into four sections, then dry each part individually. The reason for this rule is simple - no strand is left behind! But remember - drying one section for too long could damage your hair. Switch between sections if it is taking too long to get that blow out look you want. Direct hair-to-dryer contact comes at a heavy price – i.e. long-term damage! Make sure you use a nozzle or a diffuser as an extension on your hair dryer. The diffuser ensures that heat is spread evenly across your hair, while the nozzle makes sure that the heat doesn't touch your hair directly. That will go a long way in reducing the damage. Regular blow-drying is bound to cause a loss of nourishment to your hair – but that’s not to say you shouldn’t do it! Like with every other part of your body, your hair needs a top up. Oiling your hair regularly with coconut oil not only nourishes it, but also hydrates and heals the damage from within. Replenish the moisture in your hair organically with some great coconut oil massages. There you go! You don’t have to skip that morning blow-dry routine – just do it the right way to maintain that gorgeous, enviable mane! Blow-drying is great – when done the right way. Choosing the right blow-dryer is the first step in blow-drying your air the right way. 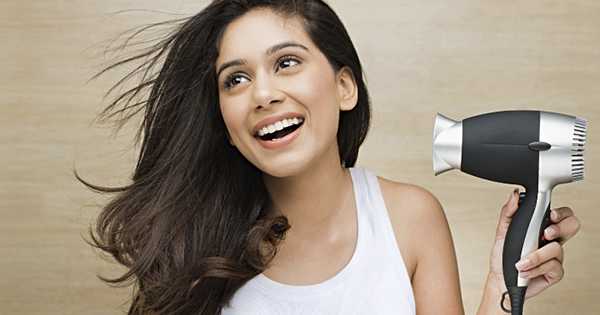 Nourishing and taking care of your hair is just as important, as blow-drying it right!